Review of "Chronic Empire" by Xavier P. and RadioIndy.com! 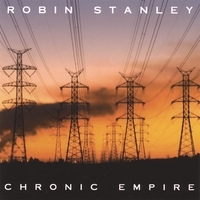 “Chronic Empire,” the latest CD from the brilliant Robin Stanley, is a soothing collection of guitar-driven pop/classic rock tunes! Kicking off with the unforgettable “Once Upon a Time,” one cannot help but notice Robin’s robust vocal appeal. His unique, graceful tone breathes serenity into his compositions and is nicely complemented throughout the CD with tasteful harmonies! Masterful instrumentation is added to the list of accolades for “Chronic Empire,” especially the impressive guitar work throughout the CD, including the leads of “Born Under a Bad Sign” and "Best Mistake," the melodic electric guitar line of "Suburban Lawns," and the acoustic guitar work on numerous tracks. The cornerstone of the CD is Robin's songwriting: Tracks such as “One Way avenue” "Suburban Lawns" and "Best Mistake" show off Robin’s keen sense for catchy choruses and relevant, well-crafted, and clever lyrics. Best of all, this CD is wonderfully produced with clarity and skill! Die-hards of Beatles-reminiscent pop and Tom Petty-infused classic rock won’t be able to turn this one off!